This week, Wind Horse USA office entered into an agreement with Bhutan Airlines, to be their General Sales Agent and representative in USA. Bhutan Airlines is the first private Airline, formed by Tashi Group of Companies, the largest business house in Bhutan. Tashi Group was formed more than 50 years ago. Tashi group operates shopping centers, several brand of hotels, mobile phone, many large and small industries, from carpet weaving to Beverages, Brewery, to large industries such as Ferro Alloys, and Calcium Carbide. Bhutan Airlines began as a domestic carrier using one A Pilatus PC12 in December 2011. It started International fights in October 2013 with an A320 aircraft on a wet lease (with all foreign crews and services) from Lithuanian chartering company. On 24th April 2014, Bhutan Airline’s new Airbus A319 -112 aircraft with seating configuration of 122 comprising 8 Business class, 36 premium economy, arrived at Paro airport. It will begin operating from 1st May 2014 with its own Bhutanese crews. Bhutan airlines has appointed 4 most experienced Bhutanese captains from Druk Airlines. 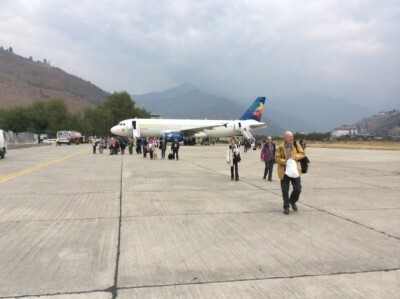 Ever since Bhutan airlines began operating it has proven its reliability, flexibility and good customer services. As a travel agent, ground operator and promoter of Tourism in Bhutan, Wind Horse welcomes the 2nd Airline necessary to create healthy competition for better price, services and efficiency.